Mental health has historically been a neglected health focus in preventive health and overall health maintenance. Mental health care availability is gaining support in the U.S. and helps improve quality of life and health outcomes. 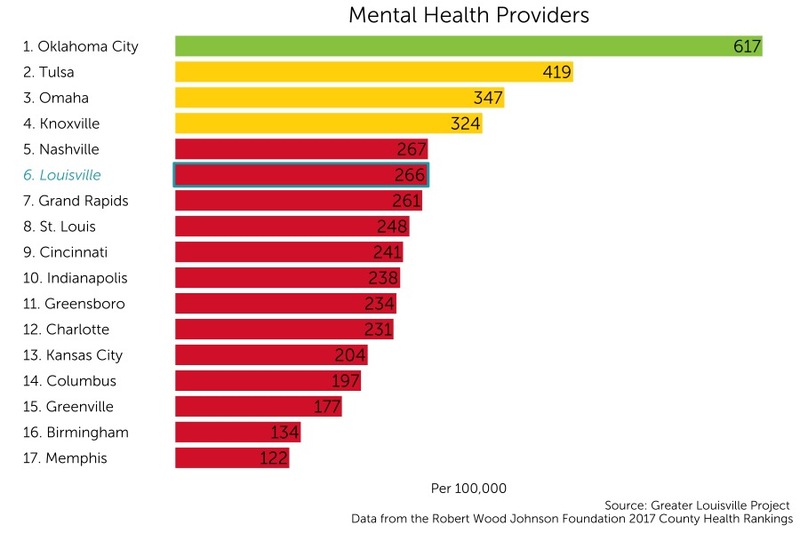 Louisville currently ranks 6th among its peer cities in number of mental health care providers per 100,000 with 266 providers per 100,000 people. Despite the high ranking, Louisville still ranks among the bottom tier of its peer group according to a natural breaks algorithm. Cities in green are those that outperform their peers, cities in yellow represent the middle cluster, and those in red are a group that lags behind its peers on this indicator.